This entry was posted on December 1, 2015, in Easyjet Traveller. Bookmark the permalink. 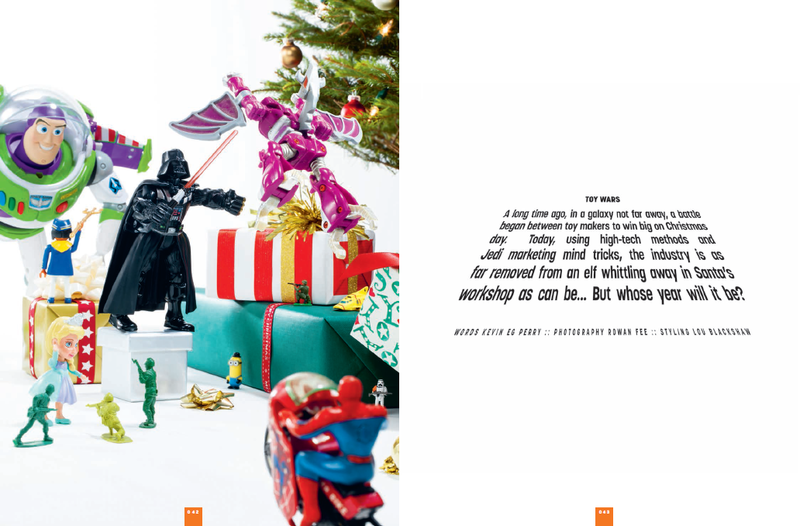 A long time ago, in a galaxy not far away, a battle began between toy makers to win big on Christmas day. Today, using high-tech methods and Jedi marketing mind tricks, the industry is as far removed from an elf whittling away in Santa’s workshop as can be… But whose year will it be? Picture the scene. It’s Christmas morning 2014 and parents across the world are being woken, bleary-eyed in the far-too-early hours, by their excited, expectant children, all with but one thing on their minds. What’s wrapped up underneath the tree – and soon to be ripped open – will have a greater bearing on the outcome of the day than whether Mum has decided to follow the year’s hot-chef advice of pre-brining her turkey or which box set Dad will fall asleep in front of. For a fairly large proportion of little girls in the UK, that item is a doll called My Friend Cayla. Earmarked as the year’s hottest toy by retailers such as Hamleys, Cayla talks. Of course, talking dolls are nothing new – Edison first invented one back in 1890 – but Cayla’s wi-fi internet connection means that she can check Wikipedia in the blink of a plastic eye and answer pretty much anything you throw at her. Think of her as Siri with brushable hair. Cayla proved so successful that this year her maker, Surrey-based Vivid Imaginations, is expanding the range to include My Friend Freddy Teddy for younger children and a robot called i-Que that’s aimed at boys, both of which employ the same sort of cutting-edge technology. It’s fair to say that the days when children would be satisfied with a puzzle or a painted wooden figure are long gone – and the stakes for toy makers are immeasurably higher, as a result. In fact, you could say that, as we go about obliviously eating, drinking and indulging, a turf war is being played out every year for supremacy beneath our Christmas trees. And every toy company on Earth wants to come out on top. According to trade group Toy Industries of Europe, Europeans spend over €16.5bn on toys each year and over half of those sales are in November and December in the run-up to Christmas. Now, companies pour their resources into spotting trends years in advance and into harnessing new technology. Yet, predicting and producing the year’s must-have toy remains a Jedi mind trick made even tougher by the fact that new products have to win over not one, but two of the most fickle, critical and discerning audiences on the planet: children and their parents. Probably the safest bet is to ride in the wake of a wildly popular film franchise. Scan a list of the predicted top sellers for 2015 and you’ll see Minions, Disney’s Frozen and, inevitably, Star Wars featuring highly. If there’s one toy that’s never had trouble connecting with an audience, it’s Thunderbirds’ Tracy Island. It’s been one of the toys most associated with Christmas in the British popular imagination ever since 1991, when short supply led to the BBC reporting on fights breaking out between parents in shops and a flourishing black market in secondhand sales. After more toy sets were produced to meet demand the following Christmas, it went on to be that year’s top seller. By then, Blue Peter presenter Anthea Turner had staked her claim for immortality by showing those who’d missed out how to build their own out of shoeboxes and sticky-backed plastic. In 2000, a revamped Tracy Island play set again became the Christmas bestseller, so perhaps it’s no surprise that with new CGI series Thunderbirds Are Go on TV at the moment, a new iteration of the toy is enjoying yet another lease of life. Now also manufactured by Vivid, this year’s much-expanded version, complete with more sounds, bells and whistles, was named at the top of Hamleys list of predicted top sellers this Christmas. It’s a testament to the invention and ingenuity of Gerry Anderson and special-effects designer Derek Meddings that their creations still inspire children 50 years after Thunderbirds first aired – and also to the legacy of Keith Shackleton, who was the man who masterminded the toy side of the company. Which brings us right back to this Christmas. The fact that Tracy Island is competing for shelf space with toys from the new Star Wars film is, in fact, a battle between teacher and student – a plot fit for a space opera. For maverick inventors and independent designers, figuring out how to fit their toys into existing worlds can make or break whether one of the bigger companies will help them take it to market. This year, Disney are marketing a Millennium Falcon drone – a good example of taking a new piece of technology and fitting it into a world of toys that children (and their parents) are already interested in. Star Wars is such a powerful force in the toy market that it even had a little-heralded impact on the survival of one of the world’s most successful toy companies. Back in the late 1990s, LEGO was floundering and dicing with bankruptcy. While it was struggling to modernise, it did have one big-selling product line keeping it afloat: Star Wars, its first outside licence. As the company rebuilt in the 2000s, they went on to licence a whole host of other franchises, including Harry Potter and Pirates of the Caribbean, but it’s Star Wars that has remained the biggest seller, even as the brand diversified into computer games. The LEGO Movie has also helped the Danish company to a stunning recovery and annual global sales approaching 28.6DKK (€3.83) billion. Meanwhile, as battles rage between companies competing to create the newest tech and bid for the biggest film franchises, other toy companies still exist in a rather more sedate world, where they know their tried-and-tested formula works. Germany’s Playmobil, for instance, is targeted at younger children and pulls in an annual revenue of over €552m, without plastering any famous faces or brands on their boxes. 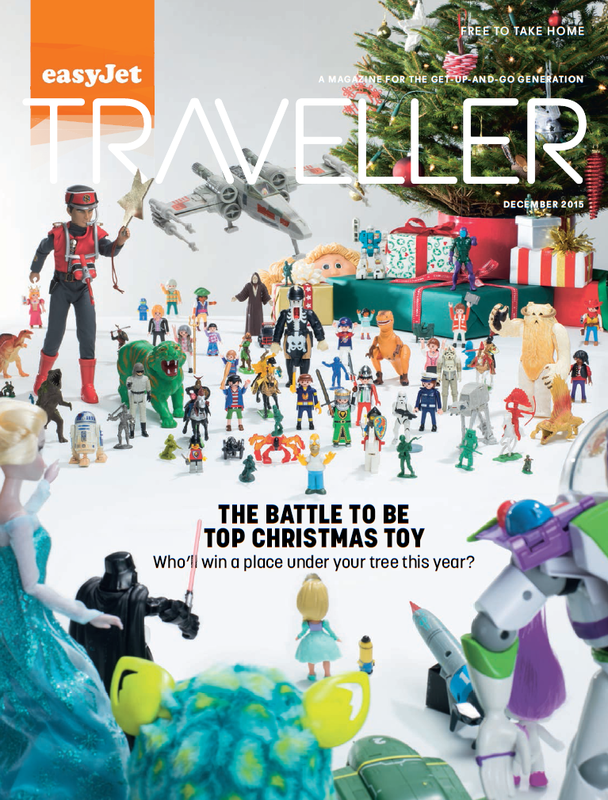 Cover story for Easyjet Traveller, December 2015. « The Beastie Boys Story Is Now A Play With A Puppet Rick Rubin – But Does It Work On The Stage?